Pathogenic wind cold damp causing chills, headache, nasal congestion, stiffness in neck and shoulders and body aches. Influenza or measles without fever, arthritis imbalances aggravated by changes in climate and skin sores including abscesses, eczema and mastitis are some of the imbalances satisfied clients have used this product for. Schizonepeta tenuifolia herb, Saposhnikovia divaricata root, Bupleurum chinense root, Peucedanum praeruptorum root, Ligusticum chuanxiong rhizome, Notopterygium incisium root & rhizome, Angelica pubescens root, Poria cocos fungus, Platycodon grandiflorum root, Glycyrrhiza uralensis root, Zingiber officinale rhizome-fresh, Activated carbon, Botanical wax, Talcum. 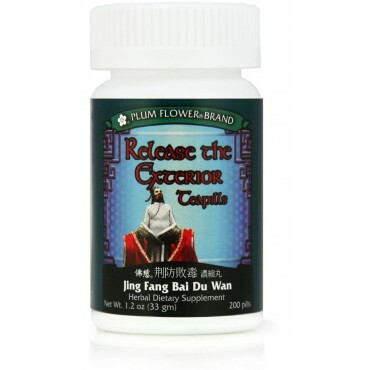 - Jing jie, Fang feng, Chai hu, Qian hu, Chuan xiong, Qiang huo, Du huo, Fu ling, Jie geng, Gan cao, Sheng jiang, Activated carbon, Botanical wax, Talcum. Contraindicated for complaints due to wind-heat, but suitable for imbalances of wind-cold transforming into heat. Use with caution during pregnancy.